At Aqua Pool and Patio, we know that making the decisions around bringing your pool dreams to fruition can be difficult. That’s why we boast a family-owned and operated business dedicated to designing, installing, and servicing the highest quality swimming pools, spas, and landscapes. We have experience on our side and can help you articulate exactly what you want. 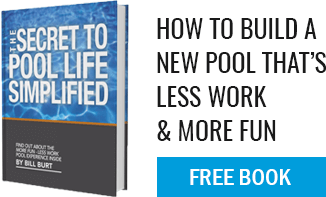 When it comes to selecting the right interior finish for your pool build, there are a couple of things to keep in mind. Plaster/Marcite Finish – If you are looking for that classic, crisp white, grey, or black look then the traditional plaster finish is for you. As one of the tried and true pool finishes, this reliable standard delivers a simple and straightforward look. Quartz Finish – There are multiple “brands” like Diamondbrite and others. These finishes are stronger and more durable than standard plaster. Quartz as an aggregate is added to the sand/cement mix and allows the owner to have more color options as well as more chemical and stain resistant finish. Newer technology on the market has given pool builders and owners a strong option with exposed aggregate finishes that contain texture. Able to incorporate ceramic, marbles, pebbles and other products, the popularity of this type of finish stems from it’s ability to incorporate a variety of colors and surfaces. With more than a dozen or so pool homeowners that are proud to show off their Aqua Pool work, we are happy to offer an exclusive tour of different pools to showcase the variety of looks possible to our customers. From freeform to geometric, dark finished to light colored, allow Aqua to help you find the interior which best suits both your needs and desires. Plus, see a few of the finishes in action for yourself!